The Blue Ground Pigeon is similar to a common dove but of very small size. The male is uniformly greyish white all over, but the wing tips are black, and the wings have strings of diamond-shaped black spots. The female replaces the grey-white color with a light to brown coat. The range of the Blue Ground Pigeon is southern Mexico and the upper 2/3 of South America. Blue Ground Pigeons inhabit dry areas of savanna and open areas. Blue Ground Pigeons spend days foraging in pairs to small groups. 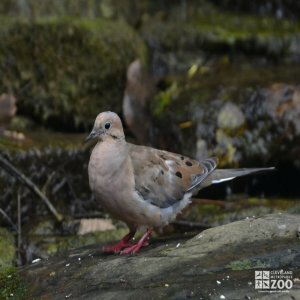 Breeding of Blue Ground Pigeons depends on the area, but if the food supply is good, it could be year round, though mainly spring into summer. They can form a nest of twigs from the ground up to shrubs.